Learn how the Methow Valley Community Preparedness Committee and the L2020 group of Port Townsend, are successfully inspiring a broad spectrum of people to engage in sustainable, community-building activities in their local areas through community preparedness. On Twitter? Get your Transition Twibbon. Transition Towns Rise in the U.S.
"On the national level, America looks unwilling to come to terms either with its addiction to oil or with the need to address global warming, but that pessimistic vision is far from the whole truth. 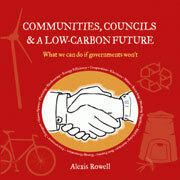 Locally, towns are taking on sustainability issues..."
This new Transition book by Alexis Rowell is designed to inform and inspire councils and councillors, as well as local environmental activists, community groups and Transition Initiatives. While central government is busy setting targets they know they will never have to meet, local government can break the logjam of helplessness, denial and despair over climate change and peak oil. Reports this month come from countries including the Netherlands, Italy, Sweden, Canada, USA, New Zealand, Australia as well as around the UK. From Aukland, New Zealand is the history of the Ooooby (Out-Of-Our-Own-Back-Yards) project and this great video that gives a bit about Ooooby's history - a social business that is all about local food EVERYWHERE! HEALTH: Human Health and Well-Being in an Era of Energy Scarcity and Climate Change by Brian Schwartz & Cindy Parker. Keep up with all the big news at Post Carbon by subscribing to PCI's mini messenger.